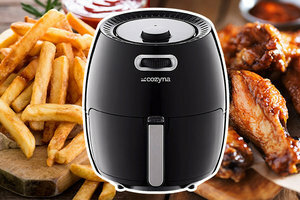 Consider this your air-fryer bible: everything you need to know, plus the ultimate healthy recipe roundup! It cooks your food with hot air instead of hot oil. The food goes into a basket, like a typical fryer. But it's blasted with high-speed hot air instead of submerged in hot oil, which cooks the food to a crispy “fried” finish. Genius! It does a LOT more than just fry. This baby can also bake, grill, and roast... Yes, really! The accessories pack recommended below opens up a world of possibilities. Cleanup is easy. Just toss the fryer pan and the basket right into the dishwasher when you're done. No, this isn’t a pack of bows and earrings to dress up your appliance… This kit features a cupcake pan, a pizza pan, a cake barrel (a.k.a. 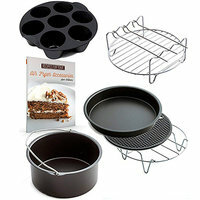 a deep cake pan), a metal holder (cook two layers of food at once! ), a multi-purpose rack with skewers, and a silicone mat. 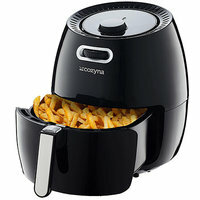 THAT'S A LOT, and it’s compatible with most XL air fryers, including the above find. And of course, it includes a recipe booklet to help you break in your new accessories! Time for air-fryer Hungry Girl recipes… all under 225 calories! Bonus! We’ve added alternate air-fryer directions to several of our classic recipes that are faux-fried in the oven. Check out our Faux-Fried Pickle Chips, Faux-Fried Artichoke Bottoms, Crispy Eggplant Fries, Apple Fries, Crispy Zucchini Fries, and Clean & Hungry Onion Rings. YUM! Today’s Happy Chew Year Challenge: What’s your favorite upbeat music for calorie burning while walking, dancing, or working out? Head over to Facebook or Instagram to share your picks and get ideas! Click "Send to a Friend" to share this air-fryer knowledge!